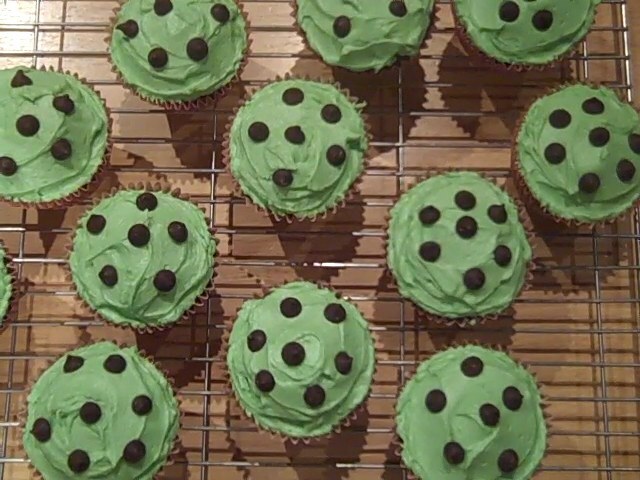 If you like chocolate, and you like mint, you’re going to love these cupcakes. Beat the butter, milk, peppermint extract and half the icing sugar until smooth, this can take several minutes with an electric hand mixer. Gradually add the remainder of the icing sugar and beat again until the buttercream is smooth and creamy. Taste the icing at this stage to see if you want to add more peppermint extract. Add a drop of green food colouring and beat thoroughly. Add more carefully drop by drop, and beat after each addition to build up to your desired colour. Use the icing to decorate the chocolate cupcakes, then top with chocolate chips. For a Christmassy looking cupcake you could top with crushed candy canes.